Stitches was tons of fun, as usual. I did get to spend some time visiting vendors but I spent most of my time at the TKGA/CGOA booth with Penny Sitler, the Executive Director of TKGA. Suzanne Bryan, Binka Schwan and Celia McAdams, members of the Master Hand Knitting Committee were at Stitches and spent some time at the booth as well. All are wearing sweaters they have knit and are holding purchases. We aren't able to get together all that often. Stitches is a great opportunity. The other thing I did was to spent time with Elff and Sandy at RedFish Dyeworks selecting the yarn for my next stranded sweater. 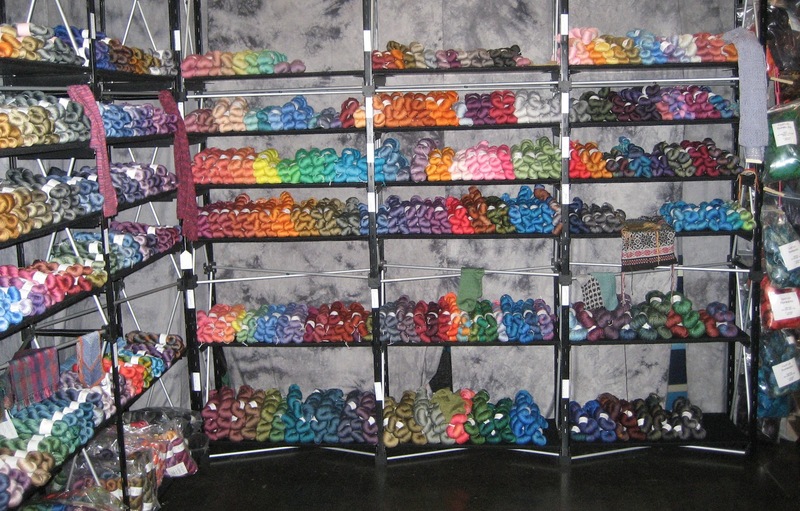 The photo taken before the show opened (as poor as it is) can give you an idea of why I like their yarn so much. The colors are absolutely wonderful. 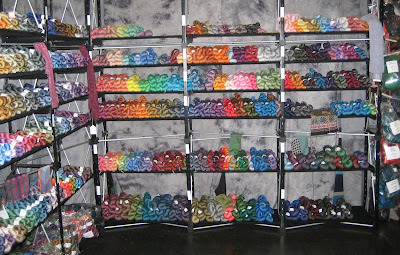 I couldn't resist their new sock yarn (bottom shelf). I am very excited to start work on the new sweater. I also visited Miss Babs' booth which was always packed. She was nice enough to give me three skeins of yarn as door prices for my students at the Grand Retreat. I picked up some sock yarn for myself as well. The Market at Stitches was very busy. I think the vendors were pleased. Lots of knitters working on the Masters Program stopped by. Some brought swatches for review. Many will be attending the TKGA conference in Reno this year. I was able to spend some time with Angela from AK and Marcia from CA who are working on the Basics course. Angela showed me some stranded gloves she is designing. They were absolutely beautiful. One of the things I love about the conferences is the chance to put a face to the name (or email address or Ravelry avatar). Another treat is seeing the yarn they have purchased! I live vicariously. I swore I wouldn't buy any yarn but you know how that goes. I've noticed in several of the lessons I've reviewed lately that there has been some confusion about placing bar increases in ribbing. Generally the bar increase is the first one new knitters learn as it is the easiest method. 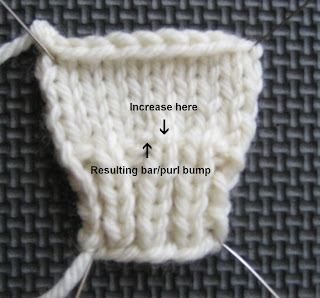 To make this increase, you knit the stitch but before removing it you knit into the back of the stitch as well. This creates a bar immediately to the left of the stitch. The goal in placing increases is that they are unobtrusive. They will never be completely invisible but that is the goal. When do you use increases? 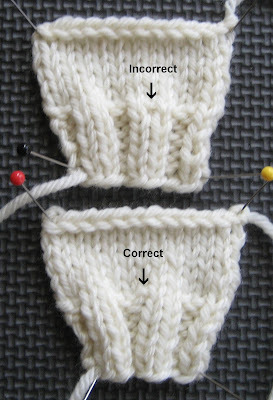 Many patterns call for increases to evenly space increases in the last row of ribbing. Salon this week will be on Saturday. The basketball team plays the last game of the regular season on Sunday afternoon. It isn't long before March Madness (and I do mean Madness) begins. 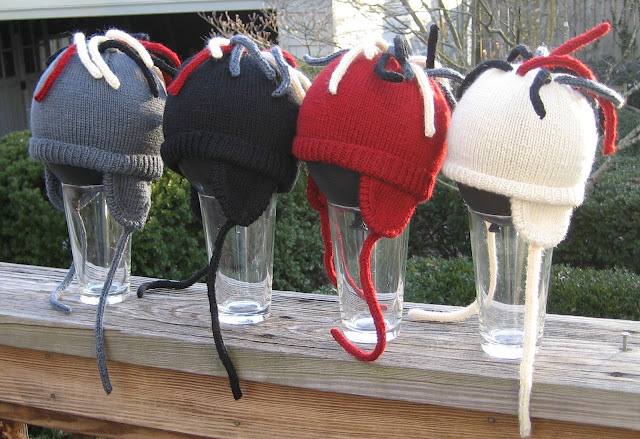 These hats will be leaving for Oregon next Tuesday. 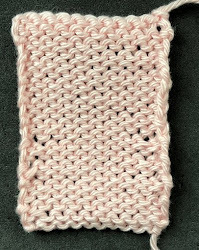 I have proposed to do the patterns for the Fall 2012 issue of Cast On. The selection meeting for designs is March 12. The deadline for proposals was yesterday. Mine got there at the last minute, as usual. I was working on these socks during Stitches and had an unpleasant day﻿﻿﻿﻿﻿﻿ thinking I'd lost one of the socks. I looked everywhere and even found some yarn the same color to reknit them. Luckily, the housekeeper at the hotel found it. The pattern is one I wrote for TKGA a few years ago as a new member gift. The yarn is Lorna's Laces Solemate which I love and the stitch pattern is a variant of arrowhead lace I used for some knee highs several years ago. These are for Jan's daughter who goes to Tulane. The colors are supposed to be Tulane's colors. I know they aren't a perfect match. Tulane's mascot is a wave. These waves are more Aegean than Gulf, however. The yarn is Yummy from Miss Babs. I spent two days charting these stupid waves. I wanted mirror images and you wouldn't think that it would be all that hard. It was. The colors will be reversed on the second sock. I think I'll ask Babs if she wants the pattern. If she does, I'll write it up. Thank goodness you found the other sock! It is always great to get together with you! The wave pattern is beautiful. I hope you do write it up!